The focus of the annual conference and exhibition was on delivering user centric, adaptable facilities on time and within budget. Attendees learned about and discussed how to build and develop health facilities that are more efficient and suited to meet the health demands of the coming century. The Lady Cilento Children’s Hospital (LCCH) featured as a headline case study at the conference. The project represents Queensland’s largest ever capital investment in children’s health, boasting around 80,000 square meters of floor space. In total the project is expected to cost $1.4 billion. The LCCH case study, jointly presented by Karl Scott, Deputy Project Director, Lend Lease demonstrated how a strong collaborative process between all parties – client (Children’s Hospital and Health Services), architect (Conrad Garett Lyons) and contractor (Lend Lease) – has been an active catalyst for change. 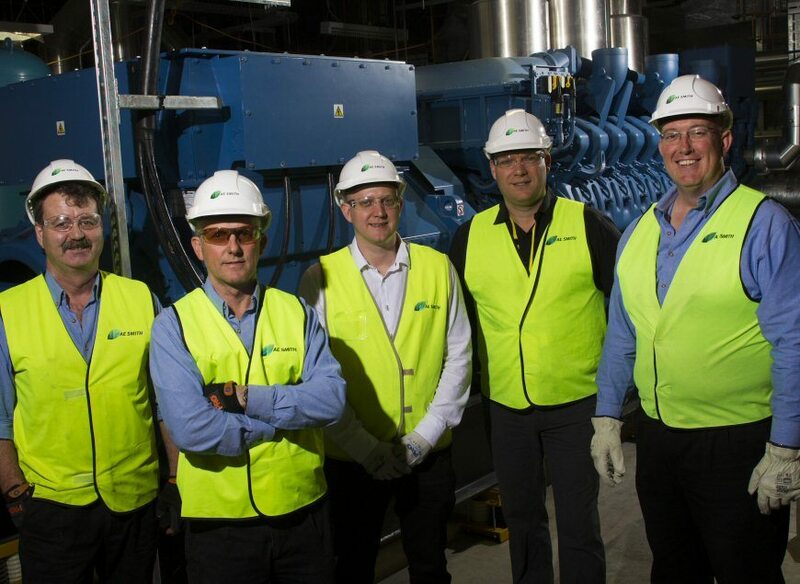 An integral element of the LCCH project is the integration of a turnkey trigeneration energy plant, the largest of it’s kind in Australia. This met client objectives to increase energy efficiency and energy security as well as reduce emissions. The world-class central energy plant, constructed and commissioned by AE Smith, will occupy 4,500 square meters across five stories and meet all the power, heating, cooling and steam requirements of the hospital, research facility and planned future buildings. Well placed to talk about powering the health of a nation are AE Smith’s Josh Daley, LCCH Project Manager and Ashley Robinson, LCCH Project Director who represented AE smith at the event. “Hospitals are large energy users, and typically HVAC solutions form the majority of this usage. Every health facility, whether old or new should be asking how they can save on energy costs and cut emissions,” says Ashley (pic left, standing second from right). During peak consumption times, the new trigeneration energy system at LCCH is expected to lower demand on grid energy by 60% and emissions of carbon dioxide will be reduced by some 17.8 million kilograms per annum. At the AE Smith exhibiting booth, Ashley and Josh shared with Australian Healthcare Week delegates their insight into the challenges and opportunities of powering a health facility. “A big opportunity is to use technology and information effectively, both during construction and then afterwards in the facility management process,” said Ashley. “One of the core components of success on the LCCH project is the use of Business Information Modelling [BIM]. It increases coordination and communication and enables large portions of the energy plant to be constructed offsite using prefabricated modules. This alone helps reduces commissioning time by up to 65%,” commented Josh (pic left, standing third from right). At the heart of the world-class LCCH central energy plant is a wholistic control system designed by AE Smith dubbed SEAM (System Energy Analysis & Monitoring). “SEAM is the only comprehensive Australian turnkey software package capable of autonomously monitoring onsite energy plant operations,” said Mark Sanders, AE Smith National Energy Service Manager. SEAM tracks every element of the energy system in real time as well as controlling incoming fuel supplies. “The advantage of SEAM is that it can find, isolate and report faults. This means the facility manager or service technician can get the system back online sooner should problems arise,” explains Mark. Australian Healthcare Week looked to answer a tough question: How will Australian health facilities meet the needs of an ageing population without blowing the budget? Whilst one supplier alone will not solve the issue, Ashley and Josh were happy to share AE Smith’s knowledge on how collaboration, energy efficiency and the effective use of technology are contributing to the solution.